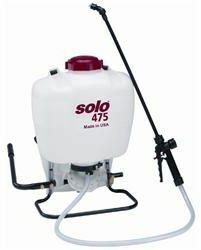 The Solo 475 produces 60 psi, with its rugged connecting rod actuated diaphragm pump. The diaphragm is made of top quality Viton for its resistance to harsh chemicals and abrasion and its long life expectancy. By design the diaphragm is able to pass small abrasive particles without damage to the pump assembly. The diaphragm pump is ideal for handling chemicals in wettable powder form, as well as liquid formulations. Lightweight, non-corrosive high density, polyethylene tank with UV inhibitors provides unmatched durability and ultra-violet protection. Contoured design, padding and adjustable harness provide real comfort. Pump handle can be switched for left or right hand operation. Recommended for wettable powder & liquid chemicals. Diaphragm pump sprayer, recommended for wettable powder & liquid chemicals.